Update 3/8/13: We removed the information regarding Stage IV from this story since it was redundant; the event ended on March 5, 2013. The North America map is now available for all tier X players. Stage III of our Rise of the Americas event will begin on February 25, 2013. We'll be opening up the entire Stage III section, which is comprised of the western United States, as our landing tournament continues to roll out. The Eastern provinces from Stage I will have a "Prime Time" start of 17:00 PST. The Central provinces from Stage II will have a "Prime Time" of 18:00 PST. The Western provinces from Stage III will have a "Prime Time" of 19:00 PST. Moving from west to east the "Prime Times" will be 17:00 PST, 16:00 PST, 15:00 PST, and 14:00 PST. Clans can land in United States, Europe, and Africa; they can land on any region. Clans can apply for landing using the amount of chips available to them. No other restrictions will be implemented in regards to how many landing tournaments a single clan can apply for. All of Clan Wars goes down for one hour from 00:00 PST (08:00 UTC) on February 25 to 01:00 PST (09:00 UTC) on February 25. Area III of the United States map opens at 01:00 PST (09:00 UTC) on February 25. All provinces in Area III become landing zones. Please note that once again, not all landing zones will be marked with a corresponding icon. Tier restriction is increased to tiers I - VIII for all armored vehicles and for all provinces for the duration of Stage III. All of Clan Wars goes down for one hour from 01:00 PST (09:00 UTC) on February 25 to 02:00 PST (10:00 UTC) on February 25. Chips and placement will follow regular Clan Wars mechanics. Boundaries between Area II and Area III come down. Clans that own land in Area II can migrate to Area III for the duration of Stage III. 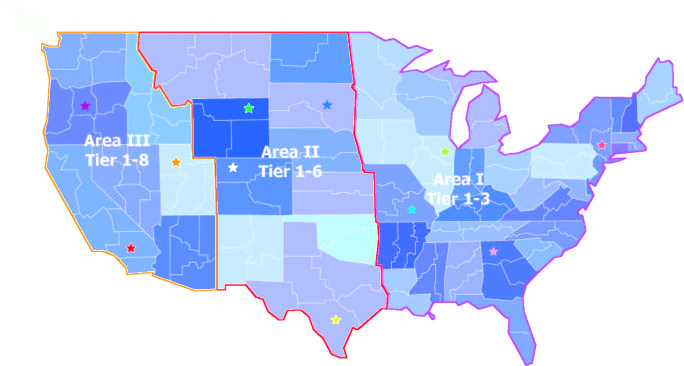 All United States regions then move to a tier VIII. Stage III continues until March 5, 2013. Atlanta, GA: "Home of the Braves"
New York City, NY: "Fuhgeddaboudit"
Riverlands, MO: "The Mighty Mo"
San Antonio, TX: Yellow star "Messed with Texas"
Missouri Plateau, South Dakota: Blue star "Rushmore, Capfast"
Big Horn, Wyoming: Green star "Butting Heads"
Front Range, Colorado: White star "Mile High Ranger"
Ogden, Utah: Orange star "Needs More Salt"
Hood, OR: Purple star "Tankz n the Hood"
Death Valley, CA: Red star "Sand Crawlers"
If you hold one of the 11 listed provinces at the end of the entire Rise of the Americas event once all stages are complete, and you hold additional provinces, you'll earn 50,000 for each province you own excluding the four listed above. For example: If you hold San Antonio, TX and four other provinces, you'll receive the Messed With Texas medal with 4 x 50,000 = 200,000 in your Clan Treasury. In addition, if you hold land at the end of the Rise of the Americas event (once all stages are complete) that does not include one of the four provinces listed above you'll receive 10,000 in your Clan Treasury per province. For example: If you hold four provinces at the end of the Rise of the Americas event and none of them are the four provinces listed above, you'll receive 4 x 10,000 = 40,000 in your Clan Treasury.